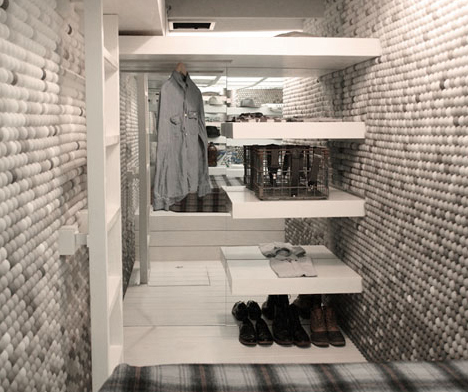 A little space, a lot of time and a dash of creative inspiration came together to form this crazy decorative scheme inside of a modest compact condo (less than 100 sqaure feet in size!) in Brooklyn, New York. 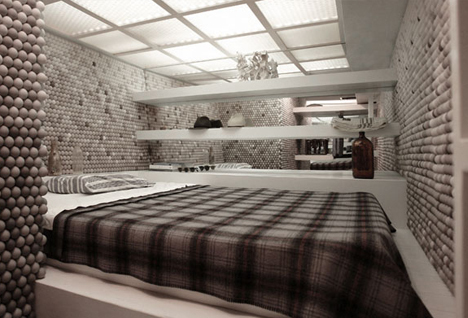 This loft is situated above (and occupied by an employee of) the NYC firm Snarkitecture – the name really does say it all. Blacks, whites and grays show the potential of gradients and light in a cramped urban dwelling. 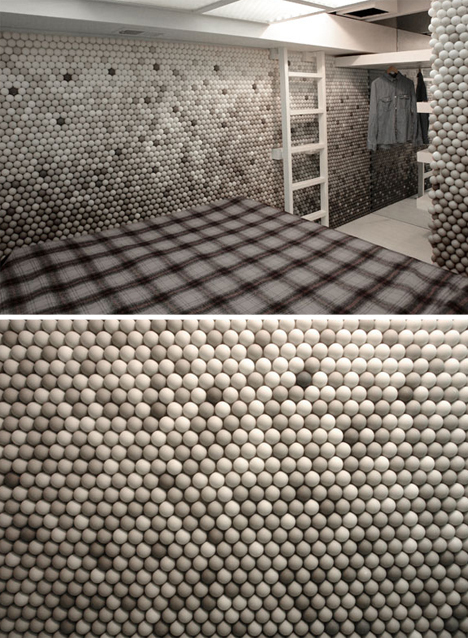 Shelves, ladders and a latticework grid of overhead lights form a series of rectilinear patterns that offset the round ping-pong-ball wall coverings. Floating white shelves, strategic mirrors and other visual elements raw eye across and through the small space to make it feel more open. The catch? Of course there always is one: ping pong balls are made of flammable material – easy to ignite and hard to put back out. Hopefully these are coated with something relatively fireproof, but even still, they could turn a decor idea into a death trap if not treated carefully.